Rodeo promoters say that the animals are wild and rough, but without the use of spurs , tail-twisting and bucking straps cinched tightly around their abdomen and groin , these frigtened animals and often docile animals , wouldn't even buck. They are terroized into action when men shove electric prods into them , twist their necks , yank them by their legs or tail , slam them to the ground and otherwise batter them. The fact that most of these innocent animals are eventually destined for the slaughterhouse in no way justifies compounding their agony along the way. Often the animals injuries are internal. Dr. C.J Habor a veterinarian who worked for 30 years as a meat inspector in slaughterhouses , saw scores of animals discarded from rodeos and sent to slaughter. 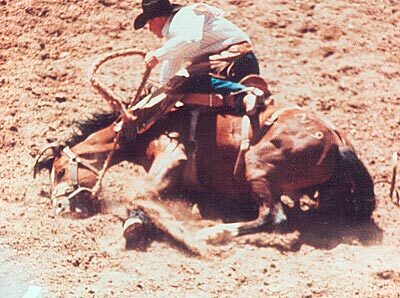 Toughened as he was to animal suffering , the conditions of animals from rodeos sickened him. He descibed them as "so exstensivly bruised , that only the areas in which the skin was attached (to the flesh) were the head, neck , leg and belly..... I have seen animals with," he said , "with six to eight broken ribs broken from the spine, and at times , puncturing the lungs. I have seen as much as two to three gallons of free blood accumulated under the detached skin. Bullfights are merciful compared to rodeos. It's high time this cruel sport be outlawed."